My big brother has never shied away from trouble, whether that’s chucking the ball at his little sister during teenage cricket matches in the garden or being in a stubble field when it was set alight, all the while prancing around dressed as a Cavalier during a civil war re-enactment battle (he wants me to point out that he was part of the crowd who tried to extinguish the fire, but still). Last year he surpassed himself when he put pineapple in a pasty and won a prize at the World Pasty Championships on behalf of his American-based bakery. Let’s backtrack a moment to fill in some much-needed detail. After years spent working at HSBC and fast approaching 50, my brother, Michael Burgess, decided he needed to sell pasties to the masses and that the US was much more in need than the UK. After all, they are generally under the impression that the only filling wrapped within pastry should be fruit. So in 2009 he set up camp just outside Washington DC in Vienna, North Virginia and opened the Pure Pasty Company. His gourmet, upmarket creations were a massive hit. Then three years ago he decided to enter the World Pasty Championships at the Eden Project in Cornwall. The first year went well. He came over with his chef Nicola Willis-Jones and my niece (his daughter) won in one of the amateur categories. So a trophy did at least find its way back to our native Cheshire. Last year, Mike made the journey again, this time with another of his chefs, Jennifer Swanston, and won in the Company Open Category. Pure Pasty’s BBQ Chicken comprised 6 per cent pineapple. 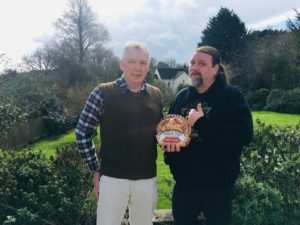 “It’s a natural element of sweetness and acid which sets off the spice in the pasty but makes up less than a half ounce of the total pasty,” says Mike. While Jen was mid-flight and Mike still in the UK, chef Stuart Moll was holding it together in the shop as the media descended. “We were proud, but it was terrifying,” Stuart recalls. Chris Evans was banging on about it on his Radio 2 breakfast show. Louise Minchin and Dan Walker of BBC Breakfast fame got involved. What was particularly interesting about being on the inside was seeing the inaccuracy of various news stories (the full details of which are detailed in an article on his website also written by me). Suffice to say, the accuracy of the articles decreased as the news spread and, by the end, the pasty was entirely pineapple and my bro was American. It’s also possible that someone alleged the crust had been crimped by Donald Trump’s tiny hands. Or maybe not. 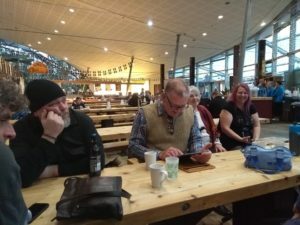 What further complicated matters was the fact that the Eden Project had been growing pineapples and for a laugh had created a pure pineapple-filled pasty. The eye-catching pic of this delight was picked up on by the press and, yep you guessed it, this became the winning Pure Pasty. 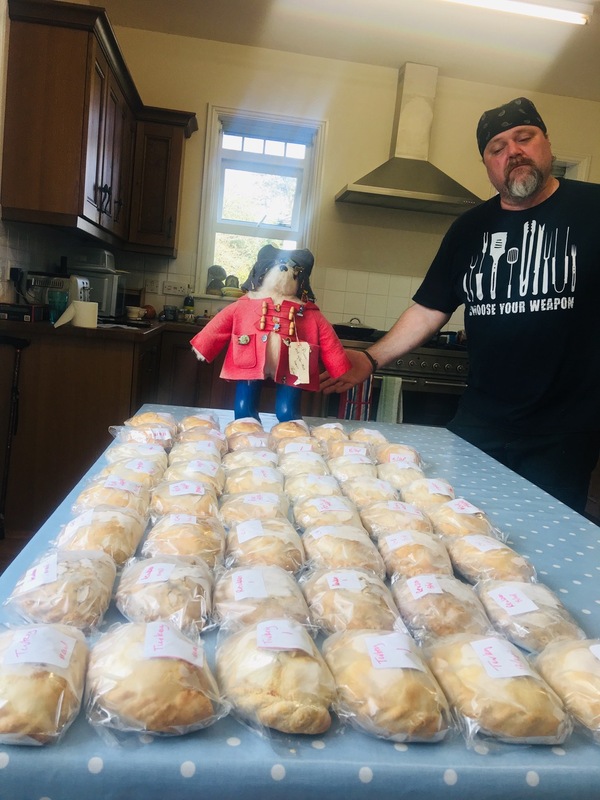 Which brings us to where we are now, at a lovely house usually used as a Catholic retreat just outside Fowey while my bro and his chef Stuart prep the hopefully prize-winning pasties for tomorrow’s completion. 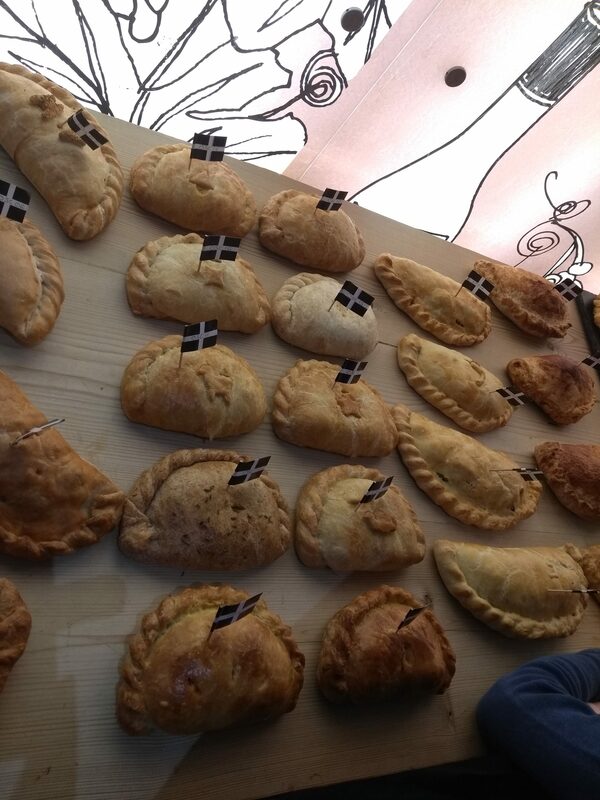 All hail the holy pasty. As I type there’s much prepping in the kitchen. Eight types of pasty are sold in the shop in Virginia. 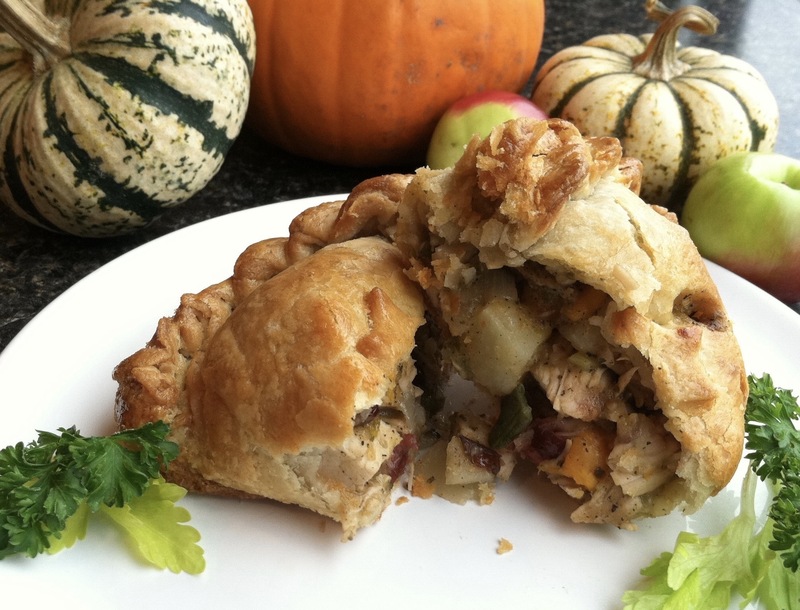 If you thought pasties only come in original and cheese & onion, you’d be wrong. The Open Savoury category is open to any combination. Yes, there’s a cheese & onion (made with artisanal cheese from the States) but there’s also a vegan option Santa Fe (South Western) Veggie, Veggie Provencal, Pork & Apple, the Indian-inspired Chicken Masala and Lamb Jalfrezi, Thanksgiving Turkey and the Reuben influenced by the famous American sandwich. Aside from that, Mike and Stuart are entering the two Professional categories, Traditional and Open Savoury. One entry is a Salmon Newburg based on a US dish and a Traditional that contains a smidgeon of Marmite. Friends from Sheffield, mum and daughter Pam and Jan Mathieson, enter the amateur category with a Duck and Rhubarb and Feta and Fennel. Mike’s old friend and Jan’s husband Paul is also there largely taste-testing, but I can’t miss out on mentioning him too. Entries must arrive early and be presented by those that made them, so everyone is up and out by 8am. 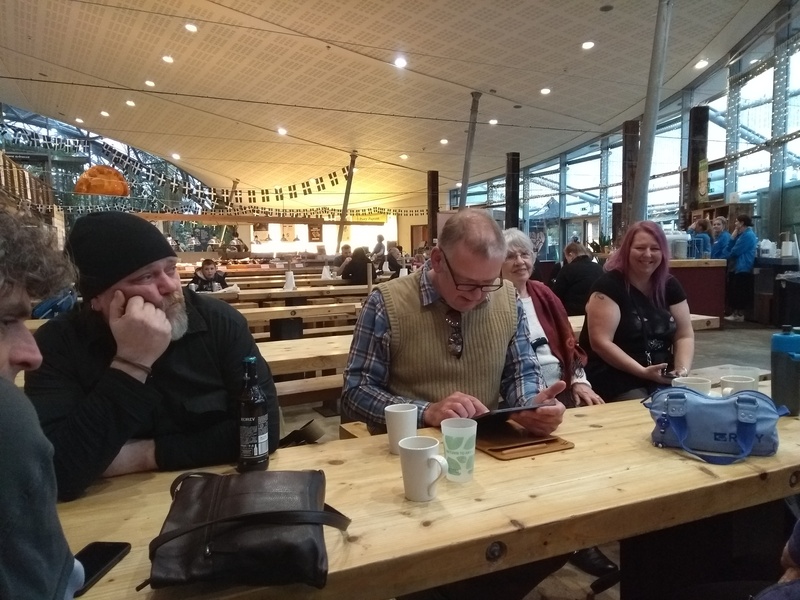 After the flurry of early excitement there follows a lot of sitting around and consuming of coffee and flapjacks from the fine kitchen at the Eden Project. A set of pasties wait to be viewed by the masses at one end while the judges are at work covertly nibbling and whispering over the ones to be dissected for judging at the other. Meanwhile, there’s entertainment all day in the Mediterranean Dome where the announcements are to be made at five o’clock. Mike is periodically called away to do interviews (after all he is the pineapple pasty man from last year) while mum holds the fort. Well, holds onto the table in the café. My friend Lisa and I pop into the Rainforest Biome for a wander. Eventually the time comes to find out who won in each of the categories.Company Open Savoury is tense. It’s the category they won last year. No third placing, nor second. Have they won or will they go home empty-handed? “And in first place is Turkey, Sage and Cranberry, Pure Pasty Company.” It’s all bloody well paid off. They’ve won again with a pasty inspired by that most American of traditions, the Thanksgiving dinner. Stuart despairs. It’s the most difficult to make and demand for it back home will be high. But he’s secretly pleased too. They’ve done it again. So, there’s no other thing for it – straight to the Ship Inn in Fowey for a celebratory beer and to ponder what to enter next time.